This sounds like a really cool event!!! Fontana, Calif. – – What has become one of the most anticipated special car weekends of the year, the California Festival of Speed is set to once again take over Auto Club Speedway on April 11-12, 2015. The annual event is a two-day, total immersion experience for fans of great road cars with Saturday given over to the wonderful world of Porsche automobiles and Sunday’s agenda’s set to celebrate the full range of euro/supercars in all of their power-packed glory. Saturday, April 11’s “menu” will include an incredible array of Porsche-centric attractions like Porsche new car test drives, a Pirelli GT3 Cup race, special parking “corrals” for each of the various Porsche models, a Porsche swap meet, a concours d’elegance, the chance to take some exciting parade laps right on the Speedway, a wide-ranging vendor’s row with over 50 companies displaying, the latest electronic driving simulators, and a special “winner’s circle” photo area where fans be able to take “selfies” of themselves with one of the on-site umbrella girls. Of particular interest to many visitors will be a special preview of the new Porsche Experience Center now being built by that company in Carson, California. In true southern California style, gourmet food trucks will be on hand both days with a delightful selection of food items and refreshments. 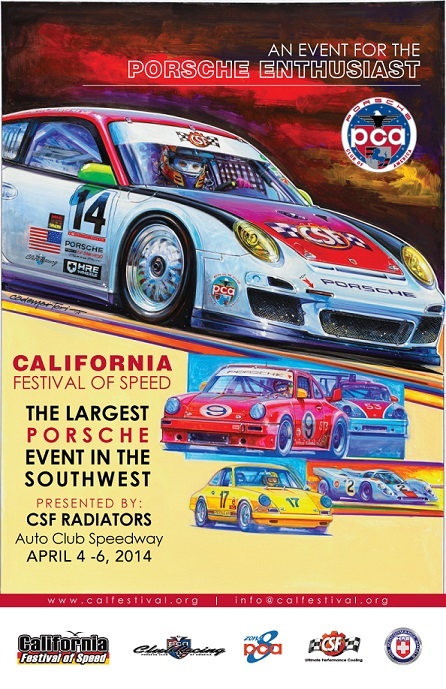 On Sunday, April 12, all the of above Porsche attractions will all be there and the Festival will add what has become the largest Supercar event in the Southwest. 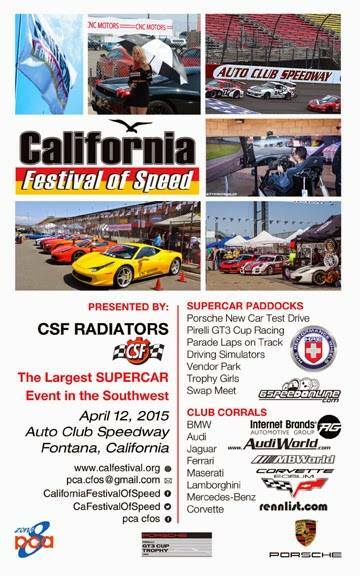 Sponsored by HRE Wheels, over 1000 exotic Eurocars are expected to roll in to Fontana from all points of the compass. Internet Brands will sponsor special club corrals for marques like BMW, Mercedes-Benz, Audi, Jaguar, Ferrari, Maserati, Maybach, Bentley, Lamborghini, Corvette, McLaren, Aston Martin and many more. Sunday’s Eurocar swap meet will be of special interest to fans and aficionados alike. There’s really nothing like a stroll by table after table of glittering parts and pieces of some incredible machines, all laid out, each with an interesting story (and maybe a bargain price) behind every one. The 2015 California Festival of Speed at Auto Club Speedway in Fontana is two full days of exotic automotive excitement and entertainment … a multi-faceted attraction that has something for everyone who loves stirring motorcars. There’s no admission charge for either day of the 2015 California Festival of Speed and parking is $10 per car (the parking ticket is good for both days).